Weekend Reading: Anchor + Woman from the Enchanted Lenormand Oracle by Caitlin Matthews. This pair asks us to do something to establish or reinforce our footing in some way. Which is to say, do something to improve your health. Or something that reinforces your reputation. Prepare your home for visitors. Sign a will. Whatever it is that would steady your world or ground your "self", do it. The anchor is a card of security and lasting stability and the woman makes that security and stability very personal and unique to you and your particular vulnerabilities. So consider what needs steadying and shoring up in your life this weekend and make a move toward it. Oh! I ordered that deck, I just fell in love with it as soon as I saw it! Love your blog! Thanks! I just got it today. I'm looking forward to reading through the book. I have hopes for it to be the first of a few coming out soon that give good instructions for reading. 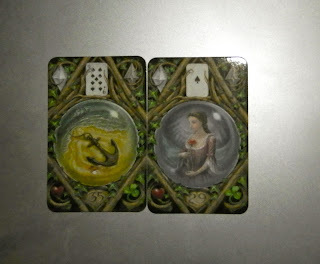 I just took a Lenormand class from Mary Greer and that was wonderful, but I'm into technique, so I like seeing what different "masters" do.